Have you ever had a predicament with an employee at work? There is no doubt you have. The truth is, conflicts happen everywhere and anywhere. The workplace isn’t the only centre of conflicts. But to solve and take care of such difficult situations can be a huge challenge at times. And it isn’t everyone’s cup of tea to handling conflicts like a professional. Conflicts mostly occur when people have differing opinion. And in a place where people belonging to different backgrounds work together, disagreements are bound to happen. Things often escalate because of lack of understanding and before you know it; relationships are often ruined in the process. So in order to prevent that, you need to use some smart and effective conflict resolution strategies to solve problems at work and get things back to normal. If you’re the CEO of your company, then this post is a must for you. Some of the top and most beneficial conflict resolution strategies and tips have been enlisted in the article, just so that you can be in control of the situation next time something horrible happens. If you would like resolving conflict in the workplace or a difficult situation at work, you need to first listen to what the employee has to say. This is a crucial step to solving conflicts almost anywhere. Make it a point to hear almost everyone involved in the party before you say something. In order to shoot a decent solution, it is important to keep a track of everyone’s opinion. Since you are the leader and it is your responsibility to solve the problem, you have to make sure that everyone is present at one place during the same time. This will help you understand employees and their behaviour better. Plus when you come up with a solution, everyone will be there to listen to you. So make sure you organize a proper meeting. Another important step you should take in order to reduce workplace conflicts at work is to be impartial. Do not show any kind of favouritism towards any employee. That would simply damage your reputation and stop people from hearing what you have to tell. If you happen to have a personal favourite, try not to make it too obvious. Instead come up with a plan that is fair and reasonable enough. Some of you might not be aware of this but motivation is quite an effective and smart technique to resolve conflicts at work. When you promote teamwork, encourage people to work harder and speak mostly about solidarity, a difference will definitely be felt. Not just that, your employees will also begin to importance of working together in a team. It is important to take care of a problem immediately if you’d like to solve it. If you don’t do so, the problem will escalate naturally and it could affect everyone’s potential. However, you must ensure to take a step with great care. Don’t jump into conclusions because you want to get over the situation. Analyze the problem carefully, speak to the ones who are involved in the conflict, take some advice from another professional if it’s beyond your understanding and then proceed. That will definitely help you in the conflict resolution process. A little praise would never harm you at work. In fact, if you could praise your workers the right way and with the right amount, you will definitely reap a few major benefits. However, make sure that you don’t compliment one employee again and again because that would again make you look like a biased manager. Instead, congratulate and shower the whole team with your words of praise and accolade. Blaming is a horrible thing to do at work! In every conflict, there isn’t going to be just one person responsible for the whole conflict situation. It always takes two hands to clap. So if you want to solve a difficult problem at work, make sure there isn’t any blame game involved. If you see it in a way, trying to figure out which one of your employees is at fault isn’t going to solve a thing. And sometimes if you blame a particular person for doing something wrong, chances are he/she will feel left out and leave the conversation immediately. So in order to refrain that from happening, always emphasize on solving the problem instead of pointing at someone. When you are trying to solve a problem, always remember to stay calm and composed. Don’t over react at all. Anger will never do you any good while dealing with a bad situation. So when a problem comes up at work, just relax and see things like an adult would. This would help you get a clearer picture and things will automatically work out sooner than later. Another step you could definitely incorporate in order to solve a conflict at work is by boosting creativity. Never stop yourself from thinking outside the box. Even though being innovative takes a little long to solve a problem, but it does permanently take care of any situation. In order to come up with something creative, you have to be attentive to what your employees have to tell. You must be able to gather some vital information before you come up with a final plan. If the problem is related to cash refunding, suggest something like discounts and free coupons. When you make such changes, employees will learn to stay more loyal to you and listen to you whenever you have something in mind. You can’t solve any problem if you aren’t confident. Most people run away from confrontation because they are too intimidated or shy. But if you are the boss, you need to show that you really are one. Tell yourself that this problem can definitely be solved. Encourage and motivate yourself. Once you are able to do that, you will definitely see a change in your co-workers behaviour. And not just any other change. It would be a positive one. It will also fight all conflicts in the long run. The sort of questions to ask during a work conflict matters a lot. Don’t focus on questions that don’t matter. Instead be careful and ask only those that make a difference. If you say something like “Why did that happen? Did you do something?” That would make the person extremely defensive. They might not want to even deal with the situation anymore. So instead of using this technique, try something like “So can you tell what happened between the two of you from the very start?” Even if you know something about the situation, you should pretend that you don’t. This will actually help you find the solution faster. And also remember to ask them for a proper solution if they have any. You never know but some of your clients could be better at this thing than you thought earlier. If it’s possible for you, try to throw a couple of options in front of your employees. Say something like “I could deal with the problem in this way or the other one- which technique is better for you”. Salesmen use this technique all the time and it works for them. It could work in your favour as well. Even though some of you are aware of this, it would be still wise to discuss the point. Being positive is very much effective when you are trying to solve a problem. Always show some empathy towards your clients. Tell them you understand what they are going through and that you are willing to take care of the situation as well. This will allow your employees to relax and calm down a bit more. Dealing with conflict at work is definitely not something that any boss or client would look forward to. But to be very honest, it is a problem that could escalate into something horrendous in the future. Even though we cannot avoid conflicts, we shouldn’t deny their existence. 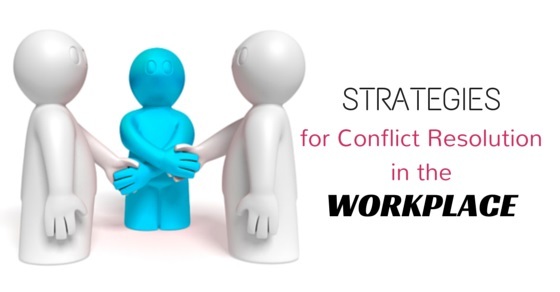 So it is very important to implement the conflict resolution strategies to deal with the problems right away in order to secure the future and safety of the company. Hopefully, the tips and ideas enlisted above have helped you. If you use all of them, there is no doubt you will reap some wonderful benefits.